160 bp upstream, the genomes harbour a large inverted repeat (palindrome) of 56 bp (N15), 42 bp (PY54) and 50 bp (^KO2), termed the telomere resolution site (telRL, Fig. 4). TelRL can be divided into the left-hand arm telL and the right-hand arm telR. Using restriction and DNA sequence analyses, it was demonstrated that the nucleotide sequences of the arms correspond to the sequences of the plasmid hairpin ends (Casjens et al. 2004; Hertwig et al. 2003a; Malinin et al. 1992). Hence the phage genomes are approximately 50% circularly permuted to their respective plasmid prophages. By comparison it becomes evident that the telRL sites of the phages share a high degree of sequence homology. Ten nucleotides in the centre are even identical in all three repeats. The centres contain a 14-bp (N15 and ^KO2) and 10-bp (PY54) alternating Pyr/Pur sequence that is likely to form a region of Z-DNA structure (Rybchin and Svarchevsky 1999). Contrary to the perfect PY54 palindrome, those of N15 and ^KO2 exhibit some mismatches. The N15 telRL site is composed of the central 22-bp telO palindrome and a 14-bp inverted repeat (L3/R3) separated from telO by three nucleotides (non-inverted sequence) on either side (Fig. 4). Following this nomenclature, the telO palindrome of the ^KO2 telRL site is 28 bp in length and separated from the flanking 7-bp inverted repeat by 4-bp non-inverted repeat sequences. The telRL sites of N15 and PY54 are flanked by two and one further inverted repeats, respectively (Fig. 4). In N15, the complex comprising the 56-bp palindrome and its adjacent inverted repeats (L2/R2 and L1/R1) has been termed tos (telomerase occupancy site). Fig.4 The telomere resolution site regions of N15, 4>KO2 and PY54. Horizontal arrows indicate the sequences belonging to tos, telRL and telO. Nucleotides within the N15 and 4>KO2 telRL repeats diverging from perfect twofold symmetry are depicted by lower-case letters. Nucleotides in the ^KO2 and PY54 telRL sites that differ from the N15 telRL sequence are marked by asterisks. Replacement of each of the nucleotides 15 and 16 (AC) and 27 and 28 (GT) with TA yields a PY54 telRL site that is a suitable substrate for TelN. The centres of dyad symmetry are shown by broken vertical lines site. After incubation with the enzyme preparation, linearization was observed with each of the protelomerases in the presence of the corresponding telRL site (Deneke et al. 2000; Hertwig et al. 2003a; Huang et al. 2004). 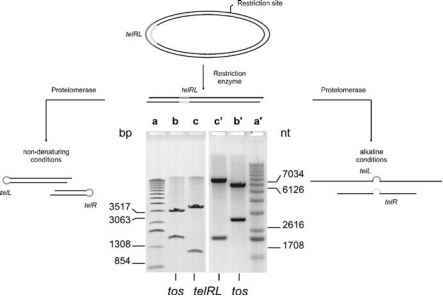 By contrast, the N15 telO repeat and a partial PY54 telRL site were not processed by the protelomerases. Processing of telRL occurred with both circular and linear substrates, indicating that negative supercoiling is not a prerequisite for cleavage. Kobryn and Chaconas (2002) performed similar experiments with the telomere resolvase ResT that generates the hairpin telomeres in Borrelia (Kobryn 2007, in this volume). Contrary to telomere resolution in prophages, negatively supercoiled target DNA was not processed by ResT. Instead, a 20-fold and greater stimulation of the reaction was observed by positive supercoiling (Bankhead et al. 2006). ment could be sequenced as a continuous single strand. The nucleotide sequence contained either telR or telL in which the sequences of the upper and lower strands were joined together at the centre of telRL dyad symmetry. These results show that telRL is processed by the protelomerase without any other phage- or host-encoded factor or co-factor. The generated fragments contain one additional covalent linkage per fragment, resembling a hairpin-like structure (Fig. 1). Thus, the protelomerase has cleaving-joining activity. Deneke et al. (2000) optimized the assay conditions for TelN and found that this enzyme is salt-sensitive and that the activity of TelN is optimal at approximately pH 7.5 and 25 °C. 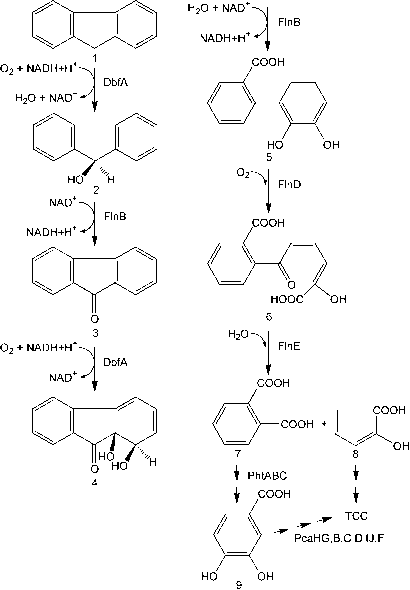 Divalent cations (Mg2+, Ca2+, Sr2+, Ba2+, Mn2+) stimulated the reaction significantly. A binding motif (amino acid positions 541 to 563) for divalent cations has already been predicted for the TelN sequence (Fig. 3). However, low concentrations (10-20 mM) of EDTA also had a stimulatory effect on the reaction and only at higher concentrations of EDTA was the TelN-mediated reaction inhibited (Deneke 2002). Therefore, a requirement for divalent cations is questionable.